In an attempt to bring one of the most famous inventions of the 20th century into the digital age, scientists of the “Ambient Intelligence Group” at the Massachusetts Institute of Technology have developed the “intelligent stickies”. These are essentially Post-its with a twist – the notes written on them can be managed by a PC that will be able to remind users of any information stored on the small paper notes at the appropriate time, via a variety of digital devices. 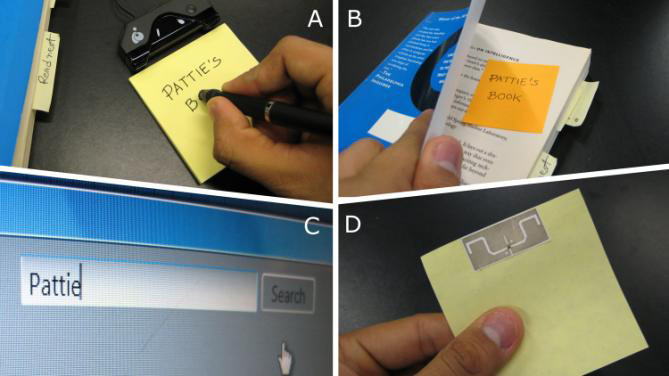 In a project that combines artificial intelligence, RFID, and ink recognition technologies, the MIT team says they have managed to make the popular sticky notes much more useful. A newly-written Quickie is a simple Post-it note, which is scribed on a sensitive pad that allows the computer to capture and store the written information. This is done using commercially available digital-pen hardware, which translates the movement of the pen on the surface of the paper sticky note into digital information. The data can be viewed at any time through the Quickie software, which stores the sticky notes as images and converts the hand-written notes into computer-understandable text using available handwriting recognition algorithms. The Quickie application not only allows users to browse their notes, but also lets users search for specific information or keywords. Using a freely available commonsense knowledge engine and computational AI techniques, the software processes the written text and determines the relevant context of the notes, categorizing them appropriately. “The system uses its understanding of the user’s intentions, content, and the context of the notes to provide the user with reminders, alerts, messages, and just-in-time information” – said the inventors. Additionally, each Quickie carries a unique RFID tag, so that it can be easily located around the house or office. Therefore, users can be sure never to lose a bookmarked book or any other object marked with a Quickie. Once the entire ‘sticky’ database is stored in the user’s PC, the user can order the software to remind him of important notes at predefined times. For example, he can choose to receive a text message reminding him of a meeting, or providing him with on-demand contact information written on a sticky note that was left at the office. The PC can also synchronize sticky to-do lists with task-lists on mobile phones and laptops. This way, users can be sure they will never have to shop at the supermarket without their grocery shopping list. The scientists say Quickies can be used to seamlessly blend the old-fashioned and modernized ways of communication – those who prefer using physical media rather than computers or mobile phones will now simply jot down a message on a sticky note and it will instantly be delivered to the recipient in the form of an SMS. TFOT has previously covered other innovative concepts developed at MIT – be sure to check out the article about the “MIT Lecture Browser” – a video and audio search tool that allows students to search for specific words in video lectures. You are also welcome to read about the “Audeo” neckband, a device that translates thoughts into speech by intercepting nerve signals. You can watch a video demonstrating the Quickies here and you can read a detailed description of the technology here.